Several groups are pushing to renew the slaughter of horses in the U.S., possibly starting in Oregon. Last weekend, we drove out to Lockport to check out the open house at the Big Run Wold Ranch, a non-profit, federally licensed, educational program which specializes in education and conservation of North American wildlife. Most of the animals at the ranch have either been rescued or orphaned. All of the work staff is volunteer. They have many animals including several wolves; both adults and pups, a Canadian Lynx, a cougar sheep, donkeys, ponies, turkeys, a skunk, some raccoons, a possum, and a black bear. Below are some photos I took at the open house. For More information on the Big Run Wolf Ranch, check out their website. Illinois State Parks Stand a Chance. Now with Rod Blagojevich out of office, Our state parks which were closed stand a chance of being re-opened. Newly appointed governor Pat Quinn who led petitions to keep the parks open will look at the possibility of reopening these parks. Now Quinn will have the opportunity to prove whether his concern for the parks was genuine or simply a means to gain public approval. Blagojevich said the closures were due to budgetary issues but local officials claimed it was for political reasons. From the looks of Blagojevich’s time in office and the way he handled money, I wonder what he actually meant by “budgetary issues”? …Read More at WQAD.com, quad cities news channel 8. On Tuesday September 24th, Senate met and voted to continue funding for the parks. Now the bill will go back to the governor for him to decide whether or not to continue funding or not. Hopefully the House and Senate’s decisions will influence the governor but ultimatly it is now his decision. As some of you know, our governor has made a $14 million dollar cut to the Illinois Department of Natural Resources funding. This funding cut has caused the DNR to layoff 39 employees and close 11 state parks and 14 historical landmarks(4 of which are national landmarks). The parks and landmarks are scheduled to close on November 1st. Many communities have spoken out against this and shown their disapproval of the governor’s decision. 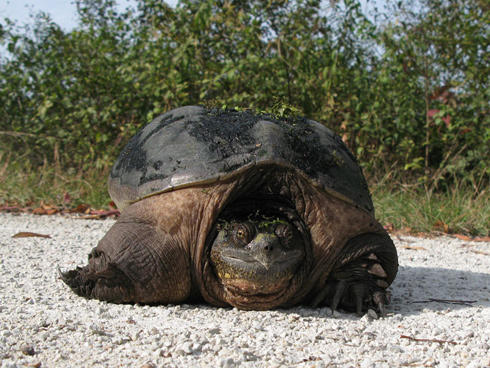 The disapproval caused an emergency meeting of The Illinois House of Representatives resulting in a vote to restore DNR funding. In order for the funding to be restored, both the House and Senate must agree. The Senate will not be in session until after November 1st and after the park closures have been made. If enough people speak out it may cause the Senate to have an emergency meeting on this issue as the House of Representatives did. I’d imagine that some of you may know more about law that I do but there are several ways we can help keep these parks open. It should only take a minute of your time. If people don’t express their opinion then our state government wont think that state parks, history, and culture are important to the people of Illinois and will be more likely to close more parks. Possibly some of the parks most of us frequent. If you really want to help, feel free to forward this message to family and friends that respect and support the use of these parks and landmarks. Here’s a listing of the state parks and landmarks that are currently scheduled to close due to the cut. Lincoln Log Cabin, in Charleston. 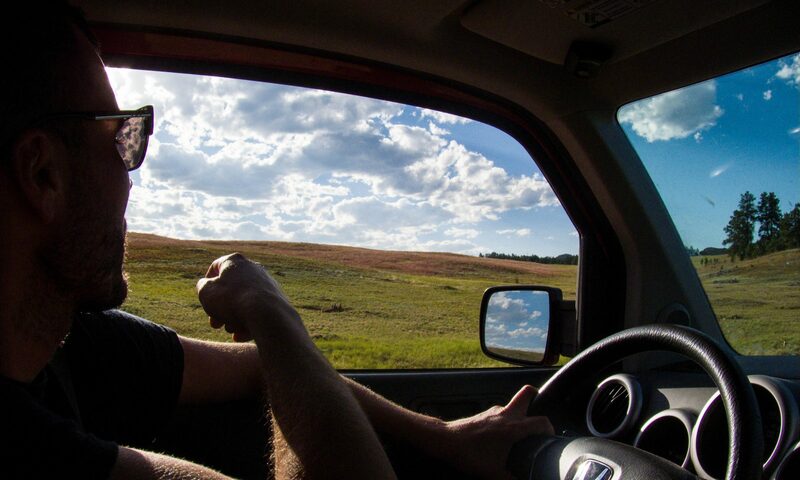 As I stood there in awe that he could just drive off after hitting me, a giant 4-miles-to-the-gallon, off-road pickup/nature destroyer that was behind him pulled up and the redneck driving leaned out of the rig and told me I should keep off the road. Keep off the road? I was merely crossing the street. I didn’t know that if you buy a bicycle you are limited to only riding it in any areas where you don’t have to cross the street. Let’s see, that would limit me to a 500foot loop of sidewalk surrounding my townhouse. Sounds like fun. As gas prices rise more and more people are supposedly supporting the bicycle cause. I don’t see it. I am getting the same response from cars that I get when I was commuting by bike from work to school in the city of Chicago 8 years ago which is that the roads meant only for cars I have people say to me “You ride your bike everywhere. That’s good more people should do it, especially with gas prices and the environment”, but the drivers on the road seem to have another attitude. When it comes down to what the law is versus what will keep me alive, I will go with the safer route. Maybe at some point cyclist/driver laws will be more common knowledge but until then I’d rather not rely on the laws for safety. Unfortunately rules of the road don’t mean anything if others don’t follow them. But for all intents and purposes, at the beginning of 2008, the state of Illinois passed a law requiring all motor vehicles to allow a minimum of 3 feet between them and a cyclist when passing. Although this law doesn’t really apply to my predicament, I only mention it because although Illinois has this law. I don’t know of anyone who isn’t a cyclist that’s heard of it. Bike Messengers get a bad rap from everyone for having attitudes, especially towards automobiles and pedestrians. Anyone who commutes by bicycle can probably see why. I’m always getting frustrated by cars. I’ve spit on cars, purposely scratched them, screamed into car windows at drivers, among other things and the one thing I can tell you is that it doesn’t do either me or the other person any good. All it does is ruin the rest of my ride and I am more apt to be agitated and run red lights, block traffic and put myself in harms way just because I am pissed off. It’s not worth it. Some people are just idiots. So what can we do? When I was hit today, I can only hope other cars saw it. The more the better. Maybe it will remind people that there are more and more cyclists on the road and cars need to allow room for them to. There are safe ways to ride. I am always skeptical about riding on bike paths vs. riding on the road because although roads have more car traffic, a car can usually see you better if you are directly in their line of vision. Since I was riding on the path it is my responsibility to make sure drivers see me vs who has the right of way. I probably could should have waited till he acknowledged that I was crossing the street. When it comes down to a well protected car vs and out in the open cyclist, it doesn’t matter who has the right of way. If there is a collision I am likely to be greatly injured and the driver of the automobile is likely to not be touched. While we were vacationing in the Bahamas this summer, we experienced quite a bit of rain and weather that was not ideal for going to the beach. We decided that rather than sit on the boat all day or go to resorts and lose money to the slot machines, we’d go for a walk in the rain. The rain actually slowed down quite a bit and once outside of the port, our walk became quite interesting. The Bahamas isn’t as nice as you see in commercials, most of it is pretty run down, the public beaches have more trash on them than the Lake Michigan beaches in Chicago. After walking for sometime we saw a sign for the Ardastra Gardens Zoo. We decided to check it out. It was actually the best zoo experience I’ve ever had. There were no crowds. Several of the animals including a pot-bellied pig and lots of flamingos were not even caged and free to walk throughout the zoo. Here are some pictures I shot on my Canon G7. Ardastra Gardens was first opened to the public in 1937. It was the brain child of Hedley Vivian Edwards, a Jamaican horticulturalist, who wanted to create a luscious garden here in the heart of Nassau. This was not an easy task as the area in those days was more of a marshland than a lush garden. He named it the Ardastra Gardens after the Jamaican defense force motto, Ardastra, which came from the latin, Ardua astrum, literally meaning â€œStriving for the starsâ€. In the 1950â€™s flamingos in the Bahamas were nearly hunted to the point of extinction. The Government at that time brought flamingos to Ardastra Gardens as an experiment to try breeding them in captivity. The breeding was not very successful but the flamingos certainly became quite an attraction in the gardens. Mr. Edwards then decided to begin training the flamingos to do a march for his guests and they have been marching ever since. The flamingos were featured in the National Geographic magazine in the October 1957 issue as nobody had trained flamingos to be comfortable around people before and so people could come closer to the flamingos in Ardastra compared to anywhere else in the world. Yesterday when I was Bike riding along the Illinois Prairie Path I met up with this guy near west chicago. 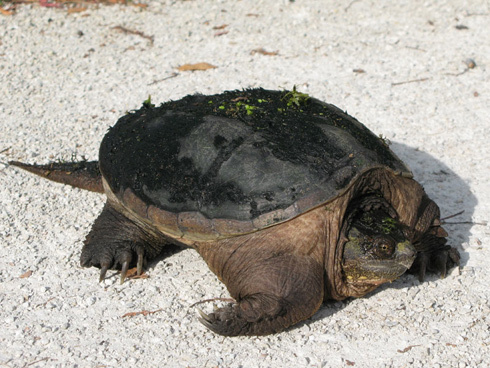 This is probably the third big turtle I’ve seen on the path in the past year. These guys like to come right out in the middle of the path and just bake in the sun. This one seemed friendly enough for a few photos. I’ve made an attempt to start a recycling program at work. At my last job I was pretty much put in charge of getting people to recycle and my duties consisted of supplying everyone with a cardboard bin for their paper and extra bins in the lunch room for their recyclables. At Weblinx, so far we have one main box up front in which we store our plastic and paper. I keep a cardboard box under my desk to put used paper in. Rather than putting this paper in the recycling bin, I am hoping to re-use it as scrap paper or to print my project reports on. Recycling paper can cost money and energy. If I am able to reuse it again before recycling it then that is ultimatly better. It’s better to use less than to just figure “oh well I am recycling so it doesn’t matter how much I use” We should be creating less waste, whether it is recyclable waste or non-recyclable. I’ve been commuting to work by bicycle in an effort to stay fit for mountain biking. I’ve got a pretty good 10 mile home-to-work route figured out. I am blessed because about 8 of the 10 miles is on paved bike paths. 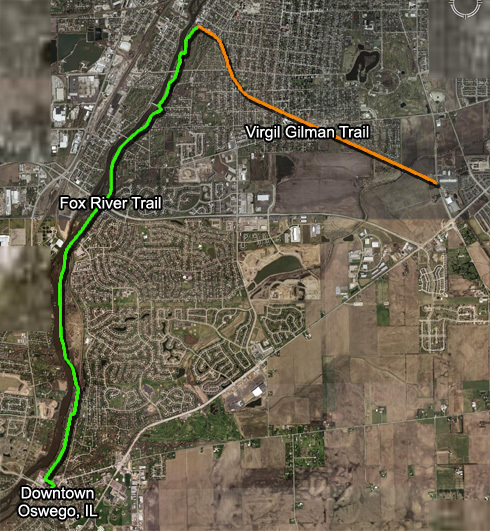 I live about 2 miles from the Virgil Gilman Trail in Aurora. From the Gilman Trail, I meet up with the Fox River trail and take that all the way into downtown Oswego where I work. I try to ride as much as I can. Most weeks I am able to commute every day unless I have meetings outside of the office. Both my bikes are mountain bikes so purchasing a set of street tires was important. I managed to pick up a pair of slick tires from Performance pretty cheap when I bought my rollers for winter training. I was able to use those although they aren’t quite strong enough to handle some of the terrain. Although my commute is primarily on paved bike paths, there are sections of the path which can be torn up or covered by fallen branches, or broken glass. It’s good to have a thicker tire to avoid punctures, however, a traditional mountain bike tire has too much rolling resistance. I have a pair of Michelin Dry XC tires that aren’t too knobby, however after riding everyday they can wear down pretty quick. I’d prefer a tire like the Continental Town and Country as soon as I can find a pair of them on sale. Although next year I might pickup a cheap beater road bike for commuting. That’s right, your friends will laugh at you but who cares. When I ride the paths in the morning through Aurora I pass plenty of people who don’t speak much English, or others who just don’t understand the meaning of “On your Left!” With a bell I am able to announce that I am coming without speaking. Typically when I ride I prefer clipless pedals, however I hate wearing my bike shoes at work all day and there isn’t enough room in my messenger bag for an extra pair of shoes. I was able to get a decent pair of platform pedals pretty cheap from Blue Sky Cycling and they’ve been great. a few years back for my birthday, my girlfriend bought me a Timbuk2 messenger bag. This has been a commuting must have for me. Timbuk2 bags are great because they also have a support strap which goes across your chest as opposed to just the shoulder strap. I can clip on a reflector light and I have enough room inside the bag to fit a folder with my work papers, my breakfast and lunch for the day, and a dry shirt and pants for changing into once I get to work. This is another necessity. If you are going to be riding to work you have to take others into account. I work up a pretty good sweat when I ride whether it’s 90 degrees of 40 degrees, and my co-workers shouldn’t have to deal with my sweat. I always keep deodorant at work. When you ride every day, your bound to get a flat every once-in-awhile. It’s important to have the right tools to make a repair or fix a flat quickly so you’re not late for work. When I ride singletrack I am a purist and the sound of my tires on the dirt and that of the trees in the wind is enough for me. However when I am riding to work, I find I can ride faster with tunes. I always keep the volume low so I am able to hear cars and people over the sound of the music. I have a wired remote which I can clip to my shirt near my neck so I can change song or volume level on my ipod without digging it out of my back pocket.